There's been a lot of interest in my stuffed cookies, so I thought I'd collect them here in a thematic list. (I can't access YouTube right now, so you are temporarily spared from a link to the video for "Good Stuff" from the B52s. Update: You are no longer spared.) I don't have a pic of the PB & J(onnie) cookie--a peanut butter "shell" stuffed with grape jelly--but I do have the recipe posted. But rest assured: pic TK soon. 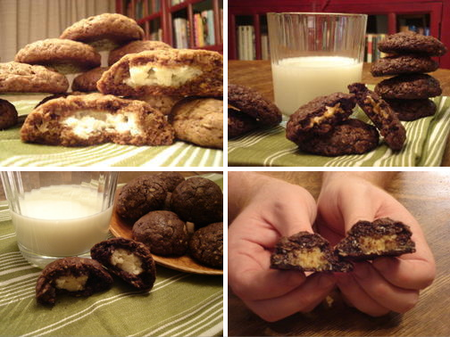 Visit my Quamut wiki to learn how to stuff a cookie. Once you get the process down, you'll be stuffing cookies...and your face.